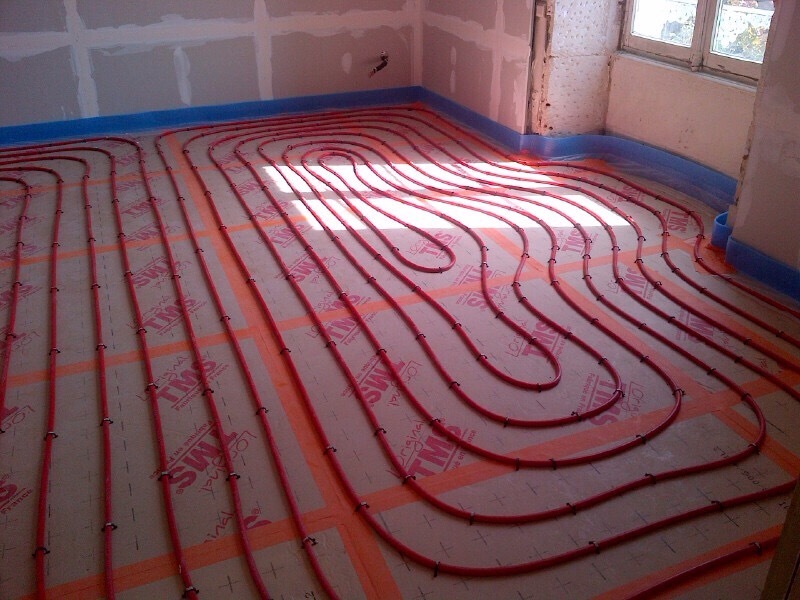 Underfloor heat, just in time for summer! Yes, those are the long-awaited heating coils. Actually, I have to rely on a contractor photo for this, as I was in Paris when things were at this stage. Now these little tykes are buried in concrete, waiting for their final connection. The electrician is here for the next two weeks, as is the plumber. Summer vacation is in the air, so they want to get things wrapped up. Actually, rumor has it that the plumbing and electrical will be 100% complete by the end of July. I live in hope. Well then, you’re going to love the Vendee in July. You guys will thaw out in no time! Thank you so much! To me it just means visible progress, at last. My druggie days are behind me, sad to say. I well understand the envy, though. I just spent a winter walking on icy cold tile floors. That’s an experience I never want to repeat! Of course they all plan to finish just in time for the compulsory big August break. In the States I would agree with you. Here, I don’t know. It might be a more general thing. Maybe jobs tend to schedule themselves around the August break. So if another job is finished now, a new one won’t start until September. That leaves however many guys with nothing else to do, so they get assigned to my house. The electrician/plumber bunch are a big company, big by French standards. They do quite a bit of commercial work and they sure engineered my house to a commercial standard. In this case I think I’m the beneficiary of the August break. The general contractor is clearly going to be in my life for a good, long time. A friend’s suggestion that I wrap up the job using the Peter Mayle ploy of a holiday party could be one that I will take. The electricians and plumbers should be out of here by the end of July. That’s what I mean’t, jobs are often scheduled to finish at the end of July with a new one starting in September. At least if this is the case you should have a pretty much done house in a few weeks. Surely ir’s mainly final fit and decor now ? Haha hahaha. Sorry. I’ll stop now. Not all the placo is in, much less prepped for paint. Not all the floors are roughed in. The windows have not been replaced. Not all the design decisions have been made, much less parts ordered or delivered. Garage? Nope, not close. We are so far from done. I’ll be sharing this house with the contractor for quite some time to come. Only the electricians and plumbers will be gone. Next Post Let’s make dinner.